A meeting was held in the Oak Hills High School with area landowners adjacent to Wayne National Forest property in May 2018 to discuss the Sunny Oaks Project. OHIO VALLEY — Due to a lapse in federal funding that caused a partial government shutdown, the Wayne National Forest has extended the deadline for public feedback for the Sunny Oaks Project on the Ironton Ranger District in southeast Ohio. The project is located east of State Route (SR) 93, west of SR 141, north of the community of Aid, and south of the community of Oak Hill. The project area is located in parts of Jackson, Gallia, and Lawrence Counties. Because the government was partially shut down when the comment period was set to end, District Ranger Tim Slone has decided to extend the period to Feb. 14, 2018. An original legal notice was published in the Ironton Tribune on Dec. 13, last year, and can be found be found online at the Wayne National Forest website at www.fs.usda.gov/projects/wayne/landmanagement/projects along with other information. If approved, the Sunny Oaks Project aims to authorize the harvest of about 2,700 acres of forest through a mix of clearcut and shelterwood harvests. These harvest types were designed to favor Oak and Hickory forest regeneration to create young, brushy forest to diversify area habitat and strengthen wildlife populations, forest workers say. 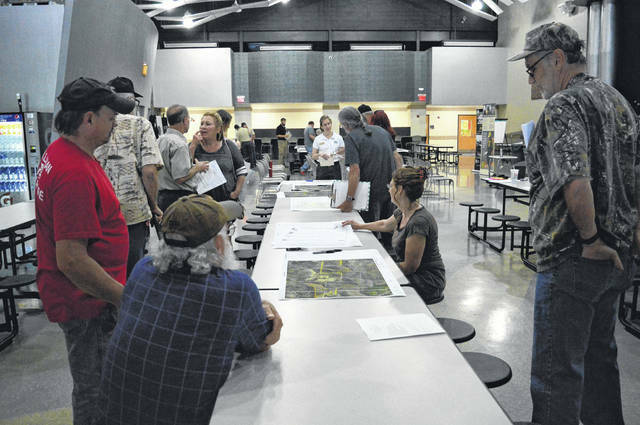 Some area residents expressed concern that they felt the Sunny Oaks Project was a reincarnation of a previously abandoned effort called the Buckeye Habitat Improvement Project and whether the need for logging and potential clearcutting was necessary. The project is located east of State Route 93, west of State Route 141, north of the community of Aid and south of the community of Oak Hill. The project area is located in parts of Jackson, Gallia, and Lawrence Counties.